01 - 「Connect」 Classical ver. 02 - 「Mami-san no Sentou Theme」 ice ver. 03 - 「Kyuubey no Eigyou Theme」 Classical ver. 04 - 「Magia」 けいえむ ver. 05 - 「Ave Maria」 Violin×Piano Ver. 06 - 「Mami-san no Sentou Theme」 Piano×Vocal ver. 07 - 「Kyuubey no Eigyou Theme」 ice ver. 08 - 「Connect」 Violin×Piano Ver. 09 - 「Magia」 TV short ver. 10 - 「Mami-san no Sentou Theme」 Violin×Piano ver. 11 - 「Connect」 Trance Remix ver. diambil dari ... entah deh! 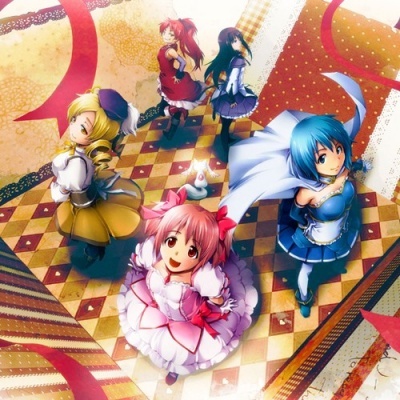 Hi, I like your homepage and of course I love Madoka's music albums! So, I would like to ask you if you can upload again this album, because the link is broken, please.